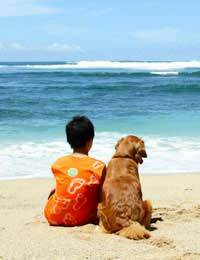 Home > Overseas Travel > Which Pets Can Travel Overseas? Since the introduction of the Pet Passport Scheme it has been possible for our pets to travel overseas and return to the UK without having to go into quarantine for six months. Strangely, ferrets are the only other animals that requires a Passport before they can enter the UK after travelling abroad. This is mainly because they, like cats and dogs, can walk and be exercised on leads and possibly run free. they are not always kept caged and away from the likelihood of catching rabies. Because of recent viruses spread by birds there are restrictions on the movement of birds. Check with DEFRA for the latest rulings as they are liable to change. Pets such as rabbits and guinea pigs and rodents are able to leave and enter the UK freely without pet passports as they are caged and not able to run freely and catch diseases like cats, dogs and ferrets. Horses have their own travel scheme for travelling abroad. Race horses have been able to travel freely for many years to races and equestrian events. All pets travelling under the Pet Passport Scheme must travel only through approved travel routes. Your travel agent can advise you of these routes or you can check with DEFRA for the current ports and airports that are working with the scheme. If you own a dog that is classed as a dangerous breed it may be that you cannot enter another country with your dog. If in doubt as to whether your breed is a dangerous breed contact DEFRA or the Kennel Club for advice. For identification purposes have your pet micro chipped. This should ideally be done at an early age. Vaccinate your pet against rabies - this can be done by your vet. Arrange for your vet to perform a blood test to check that the rabies vaccination has worked. Your vet will have to produce a certificate to prove this. Note this has to be done six months before you plan to travel. You must next obtain a PETS certificate from a government authorised vet. Each time you return to the UK your pet must have been checked and inoculated for ticks and tapeworm by a local vet. Animals that arrive at the borders of the UK on privately chartered boats or planes are not allowed entry. Where Can We Take Our Pets?